This hem is so simple! These guidelines are intended for a floor length satin gown that needs a little hemming. You will need a Baby Lock Serger (or you can overcast with your Baby Lock Sewing Machine). 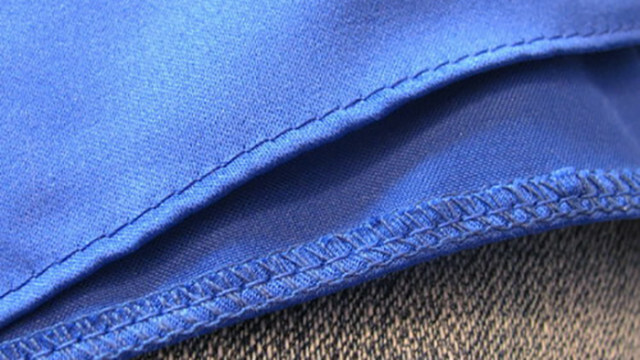 The picture below is the underside of a manufactured rolled hem of a bridesmaid dress. The hem is one circle (there are no other layers, such as a peplum, on the outside) and then, there is a lining layer and a tulle layer. The hem we will be creating will look like the manufactured hem on the outside, but will be serged or overcasted on the inside. First, you will try on the dress with the correct shoes on and have someone pin it to the desired length (pin to where the fabric lays naturally, don't push it in to where the shoe is, that will make it too short). I like to pin dresses on hard floor for accuracy (you tend to sink in the carpet a bit). Pinning at the front, sides, and back are key (it's not always the same amount all the way around, as you'll see in this tutorial). When you are first trying this, I'd pin in between front, sides and back and take those measurements, as well (take good notes as to what is your center front, side front, side, side back, and center back). I write my measurements down (first column) and then, I subtract a 1/4" and write this measurement down as how much I am going to cut off (hence c/o for the second column). Then, I remove my pins. If you are afraid of cutting too much off, mark the fold (where your hem will hit the ground) with pins as a visual as you are working to see that you are cutting a 1/4" below the pins. Then, I mark my front, side, and back hems with chalk (mark more if you have more measurements). You can mark all the way around or I put wrong sides together folding at the center front and center back to where I would cut right and left sides of the dress at the same time that's why mine is pinned to hold the 2 sides together (sometimes, however, the manufactured hem isn't very even all the way around...in this case, you'll want to measure and mark all the way around (or when you are pinning the hem, pin the excess hem allowance to the inside all the way around and iron (with steam) hem in place before taking pins out...this will ensure a lot of accuracy). After you've marked your front, back, and side, then, you'll need to mark in between. I had to gradually increase my curves from my sides seams out towards the front and back. Because I've been doing this for awhile, I can eyeball it, but, if you're new and took more measurements, mark those appropriately (you may still have to put more marks in between your measured marks to help you cut). See my chalk marks in the picture below. After I've marked where to cut, I cut! Then, you'll serge (don't cut any hem allowance off with your serger blade) or you can overcast the hem of the outer layer edge that was just cut (if you don't have a serger). This particular dress also has tulle; tulle can be cut and left as is (so, I just cut the same off all the way around, eyeballing it). The tulle may take some taming! 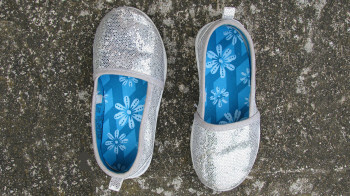 Ok, back to the serged or overcasted outer layer...I like to use the Blind Stitch foot to help keep an even edge. 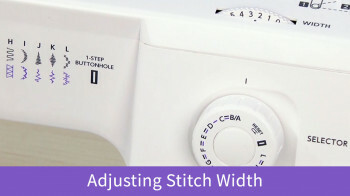 You'll want your needle in the left position with a 3.0 mm stitch length. It might be hard to tell in the picture below, but, I have the wrong side of the fabric up and am folding just the serged edge up (the bobbin thread is what will be stitching on the outside, so, you'll want to make sure your bobbin tension looks good before you sew). Place this folded edge under the left side of the foot (I also like to start at a side or back seam) butting the fold up to that center divider on the foot. 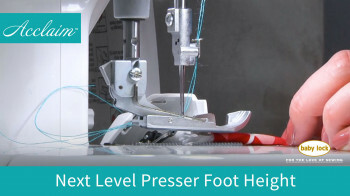 As you stitch, you'll want to hold the back and front taught, continually, but gently, rolling that serged edge over and helping your hem through (especially over seams). Continue all the way around reinforcing at the end where you had started. Press.